For the aircraft, see Lockheed U-2. U2 are an Irish rock band. 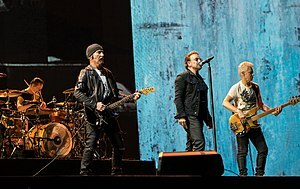 The four members of the band are lead singer Bono (born Paul David Hewson), lead guitarist The Edge (born David Howell Evans), bassist Adam Clayton, and drummer Larry Mullen Jr. U2 are a very popular band all over the world and have been since the 1980s. They have sold more than 170 million albums and have won 22 Grammy Awards. This is more than any other rock band. U2 formed in Dublin in 1976, when none of the members were very good musicians. However, they got better as they got older. They were more popular for playing live shows than for releasing albums. This changed with their hit record in 1987, The Joshua Tree. In 1991, U2 released a new album called Achtung Baby. This album sounded very different from their other albums because it was inspired by alternative rock and dance music. Achtung Baby and its worldwide Zoo TV Tour were both very popular. U2 experimented for the rest of the 1990s, making two other very different albums, Zooropa and Pop. In the 21st century, U2 returned to a more traditional sound, but they continue to be very popular and successful. They are involved in charities and helping people with groups such as Amnesty International, Make Poverty History, the ONE Campaign, Live Aid, Live 8, Bono's DATA (Debt, AIDS, Trade in Africa) campaign, and Music Rising. In 2014, the group won a Golden Globe Award for Best Original Song and was nominated for an Academy Award for Best Original Song for their song Ordinary Love which was used in the movie Mandela: Long Walk to Freedom. U2 was formed in the city of Dublin, Ireland on September 25, 1976. It was founded by 14-year-old drummer Larry Mullen Jr. He posted a note on his school's notice board, asking for musicians to create a new band. There were seven teenage boys who went to their first practice. At first, the band was called "The Larry Mullen Band", but they later changed their name to "Feedback" and then "The Hype". The band became smaller over time, eventually becoming just four people, and they finally changed their name to "U2" once Bono, The Edge, Clayton, and Mullen were left. This page was last changed on 20 June 2018, at 22:01.